INTRODUCTION Creative Europe is the European Union’s programme to support the cultural, creative and audiovisual sectors. From 2014-2020, €1.46 billion is available to support European projects across 40+ countries with the potential to travel, reach new audiences and encourage skill-sharing and development. 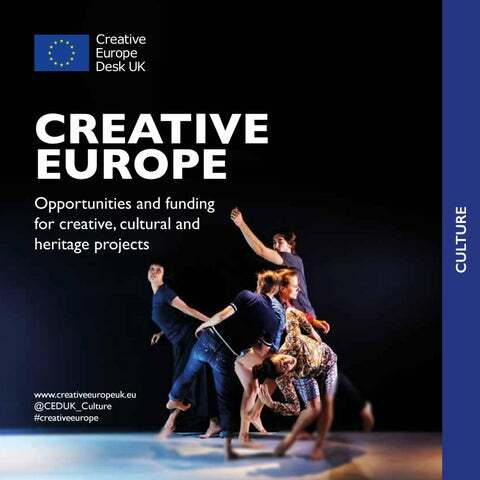 Creative Europe’s Culture sub-programme supports creative, cultural and heritage organisations through four funding opportunities: •	Cooperation Projects European collaborative projects •	European Networks Professional exchange •	European Platforms Distribution of new works •	Literary Translation Translation of European works Creative Europe runs prizes such as the European Union Prize for Literature and the European Capitals of Culture. One-off cross-sector calls have included Refugee Integration Projects and the European Creative Hubs Network. It also has a MEDIA sub-programme, investing in film, television, new media and video games. IMPACT: BEYOND FUNDING The impacts of Creative Europe are so much more than the funding it provides. 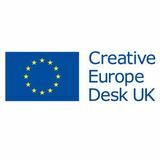 Creative Europe supports the UK to build connections across Europe and beyond. This map shows the number of projects with UK involvement that have leads and partners in other participating countries. •	Help the cultural sector to adapt to new digital developments, and encourage the use of digital technologies from production and distribution to consumption. Develop the sectors’ capacity to operate transnationally Promote the transnational circulation of works and people Reach new audiences in Europe and beyond Encourage innovation (artistic, business models) Strengthen policy making. Improve professional skills, peer learning, education or training Artistic creation or production Career opportunities Reach new audiences Extend lifespan of tour or performance or exhibition Increase consumer choice or access Capacity building of cultural operators. Involve audiences at any step of the creative process Develop new audiences and maintain existing audiences Conduct research on current and potential audiences Apply segmentation models i.e. groups/demographics/behaviour Map out your audience development strategy Integrate research and monitor progress – ask audiences what they think. Enhance intercultural dialogue Promote shared values and understanding and respect for other cultures Contribute to the social integration of migrants and refugees. European Year of Cultural Heritage 2018 legacy •	Raise awareness of common history and values •	Reinforce a sense of belonging to a common European space. COOPERATION PROJECTS Cooperation Projects is the Culture sub-programme’s main funding opportunity and around 70% of the budget is allocated to these projects. WHAT DOES THIS FUNDING SUPPORT? WHICH COUNTRIES ARE PART OF THE PROGRAMME? Transnational collaborative projects across any art form for up to four years. • EU member states • EEA countries: Iceland, Norway • Other countries, such as: Albania, Armenia, Bosnia and Herzegovina, Former Yugoslav Republic of Macedonia, Georgia, Kosovo, Moldova, Montenegro, Republic of Serbia, Tunisia and Ukraine • Organisations and individuals from non-eligible countries can still participate as associate partners and benefit from up to 30% of the project budget once the eligibility threshold is met. They aim to create an impact that is more than the sum of the individual initiatives, and applications need to show the added value of collaborative working. WHO IS THIS FUNDING FOR? Creative, cultural and heritage organisations working across any art form. This includes higher education institutions, local authorities, social enterprises, charities and companies operating in the cultural and creative sectors. Projects can be inter-disciplinary. The project leader and the partners must be active in the cultural and creative sectors and be legally established in one of the participating countries. Individuals may not apply. THERE ARE TWO TYPES OF COOPERATION PROJECTS Small Cooperation Projects • Minimum of 3 partner organisations from 3 different eligible countries • Apply for a grant of up to €200,000 • Apply for up to 60% of the total project budget Large Cooperation Projects • Minimum of 6 partners from 6 different eligible countries • Apply for a grant of up to €2 million • Apply for up to 50% of the total project budget The partnership decides how much is allocated to each organisation. Match funding is required and the partners decide how much each organisation agrees to contribute. Small Cooperation Project led by Creative Carbon Scotland The partnership brings together four cultural partners from Ireland, Belgium, Sweden and Scotland, each paired with a local Adaptation Partner Received Creative Europe support of €199,999 in 2018. Over two years, Cultural Adaptations focuses on culture’s role in adaptation to climate change. As part of the project, it: •	Develops a methodology from each pairing of Cultural and Adaptation Partners for managers of local cultural SMEs to enable them to develop and implement climate change adaptation strategies •	Tests how artists can help provide new ways of thinking and different approaches to the challenges of adapting to climate change, with each pairing embedding an artist within an adaptation project •	Will result in an international conference in Scotland to share the learnings of the project, and a Toolkit and supporting Digital Resource. Small Cooperation Project led by Ffotogallery Wales The partnership brings together four cultural partners from France, Ireland, Lithuania and Wales Received Creative Europe support of €198,000 in 2018. Over the course of two years, A Woman’s Work stimulates inter-cultural discussion exploring how women are shaping the future landscape of work in Europe. The project: •	Uses photography and digital media to support artistic collaboration, and the co-production of exhibitions, publications and online resources that challenge the dominant view of gender and industry in Europe •	Creates new opportunities for artistic exchange, offering new perspectives and dialogue on cultural difference and commonality in Europe, deepening audience engagement and offering new insights into contemporary European experience and identity •	Establishes a digital platform as a legacy and resource that will continue to grow and support further transnational co-operation beyond the life of the project. Small Cooperation Project led by Manchester-based arts catalyst Abandon Normal Devices The partnership brings together five organisations from the UK, France, Germany, the Netherlands and Spain Received Creative Europe support of €200,000 in 2017. Co-production and circulation of new artworks Capacity building in digitisation and the circulation of art works and debate online A programme of audience engagement through real world and online activities. EUROPEAN NETWORKS These encourage professional exchange and capacity building within the sector by supporting existing European creative and cultural networks. What does this network do? •	Amateo is the European Network for Active Participation in Cultural Activities •	Founded in 2008, it includes 38 national and regional umbrellas and associations from 17 EU member states and two programme countries •	Its new programme Arts Take Part aims to grow and strengthen the network over the next four years. •	IETM is a network of over 450 performing arts organisations and individual members working in the contemporary performing arts worldwide •	Its members include festivals, companies, producers, theatres, research and resource centres, universities and institutional bodies •	IETM advocates the value of the arts and culture in a changing world and empowers performing arts professionals through access to international connections, knowledge and a forum for exchange. Who are the UK members? IETM has over 70 UK-based members, including the British Council, Federation of Scottish Theatre, Prime Cut Productions, Sadler’s Wells and Wales Arts International. Founded in 1983, Trans Europe Halles is a network of cultural centres that aims to re-purpose Europe’s industrial buildings for arts, culture and activism It has brought together 109 multi disciplinary cultural centres and other cultural organisations from across Europe Its mission is to strengthen the sustainable development of non-governmental cultural centres and encourage new initiatives by connecting, supporting and promoting them. Who are the UK members? East London-based multi-purpose events space Village Underground and Belfast-based arts development and production company Beat Carnival. Aimed at publishers or publishing groups, this supports the translation, production and promotion of European fiction, poetry and plays. This funding opportunity supports European cultural, creative or heritage organisations to work together to promote new and emerging talent though co-development, co-production and programming. They make a commitment to present European-produced content and to provide visibility and mobility of new talent. Successful UK-based publishers include Book Island, Fitzcarraldo Editions, Oneworld Publications, Orenda Books, Parthian Books, Quercus Editions and Random House. The European Commission support for the production of this publication does not constitute an endorsement of the content which reflects the views only of the authors and the Commission cannot be held responsible for any use which may be made of the information contained therein. With support from the UK Department for Digital, Culture, Media and Sport and the European Commission.